Expertly built dreadnought electro with its own character and a fine set of lungs. Traditionalists looking for midrange boom may be disappointed. As far as Taylor’s V-Class bracing is concerned, the jury has given its verdict and found it to be a decisive step forward for the acoustic manufacturer, adding subtle nuancing to the models that have presented themselves to these ears so far, at least. Far from being an evolutionary leap from the more established X-bracing developed by Martin, V-Class seems to be taking its place alongside its forebears on equal terms and thriving accordingly. Prejudicial ears will always favour the familiar, of course, but open-mindedness is often rewarded. 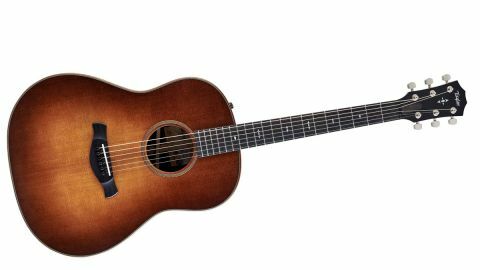 Having started as a tentative experiment in Taylor’s high-end range of instruments, V-Class bracing is now starting to filter throughout the catalogue and, judging from what we have before us today, inspiring new models in the line. Dreadnoughts without X-bracing? Well, why not? But enough about what lurks under the bonnet of this russet-hued model, let’s see how it sings. Our guitar features a deep-brown Wild Honey Burst finish (Natural is optional) over the torrefied spruce top If the rounded-shoulder design harks back to a more vintage-y aesthetic, then so does the finish using Taylor’s ‘silent’ satin on the body (again, introduced last year) to prevent the ‘squeak’ you often get from a high gloss. The whole package seems to dig back into a bygone era - at least for the hugely contemporary Taylor. The 717e features rosewood back and sides along with mahogany neck. The fingerboard is a deep dark ebony but inlays are minimal; binding is of the same colour with subtle purfling and minimal soundhole decoration. It appears the intention is not to offer a cutaway, either. Dimensionally, the Grand Pacific follows Taylor’s previous dreadnought: the body is 508mm (20 inches) long, 406.4mm (16 inches) wide with a slightly shallower depth of 117.5mm at the base tapering to 95mm by the heel. Likewise, the scale length is 648mm (25.5 inches) with a ‘wide’ nut width quoted as 44.45mm (1.75 inches). As with any of the new V-Class models, you’ll see a new Taylor label along with a black graphite loaded nut. Peer through the soundhole and you’ll also see the angled back brace and, as ever, Taylor’s exemplary craft is hard to fault, but there are numerous changes to the recipe beyond its internal voicing. Its neck shape, for example, is classed as having a “compound carve neck profile, which subtly transitions from a slight V at the nut to a rounded C, and features a rounded ridge-less heel”. There appears to be a little more heft to the neck with a front-to-back width of approximately 22mm at the 1st fret and 24.3mm by the 10th. The fingerboard edges are lightly rounded, too, which gives the neck a less pristine feel, while fretting from Taylor’s standard medium/small gauge and the new ‘arrowheads’ inlays are typically sharply done. There’s a new ‘curve wing’ bridge design that rounds the sharp points of the bridge endpoints giving a little more comfort, like the noticeably chamfered edge of the binding along with a more rounded nose to the heel (which, incidentally, has no strap button). Subtle, yes, but both help with making the design feel more comfortable and more hand-tooled. While pure acoustic models are offered, our electro versions feature the Taylor ES-2 with its trio of discrete controls - volume, bass and treble - on the upper shoulder. The output doubles as the only strap button on the base of the guitar where you also change the battery to power the preamp. Picking up the 717e, we’re struck by how similar it is to the recently-reviewed 517e, to the extent that we had to keep checking the internal labels to tell them apart. Naturally, the rosewood’s presence here on back and sides has a different cosmetic appearance to the mahogany, but in a low light, you’d be hard pushed to tell them apart. The recently-reviewed mahogany-backed 517e is a little glassier sounding, the rosewood 717e more earthy, with a smidge more bass and lower midrange presence. Always a case of personal preference, the choice would be yours, depending on what your ears tell you. Through our standard issue AER Compact 60, the twins’ slight difference in sonic personality is delivered faithfully, the 717e just having the edge to our ears, but that could be down to a personal bias to the charms of rosewood on behalf of your humble scribe. Taylor’s tried-and-tested Expression System 2 offers optimum control over electronic voicing and it confirms that both dreads are performance-ready and raring to go. It would be tempting to judge this Grand Pacific model on the difference that V-Class bracing has brought to the party, but it would be wrong to do so. We’ve already seen how the new system has proved itself, so the real question is ‘does it satisfy as a vintage-informed dreadnought?’ And we’re happy to say that it does. The slightly cleaner and less muddy lower midrange means they don’t quite fit the established thumbprint, but is that really such a bad thing? We don’t think so. The point should be that Taylor has succeeded once again in building a stage-ready, tonally adept instrument that will provide the goods reliably for years into the future. And when you think about it, you can’t really ask for more.